A RPG is at its best when the people who play it home-brew it, create for it, and share their ideas. -That's why we created the Wayfarers Guild Journal. 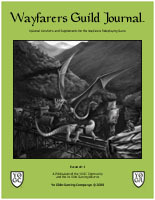 The Wayfarers Guild Journal is a open community-based semi-periodical that contains material and supplements for the Wayfarers RPG, created by the people who play it. Anyone can submit material for the journal. To do so, start by sharing your ideas here in the Wayfarers Guild Forum, or email it to jimmy@yeoldegamingcompanye.com. Not everything will be included in the journal. However, if you post your ideas for feedback, it is much more likely to be included. Issue #1 of the Wayfarers Guild Journal is now available. You can download the free PDF from the YOGC products page or the Wayfarers resources page. It may also be purchased from Lulu at cost ($6.25). Thanks to everyone that contributed their ideas and work! A small list of ideas for WGJ#2 has already been started. Feel free to share yours here on the forums!